Sightseeing in the saddle – for all knowing the bases, beginners and experienced riders. Different degrees of difficulty rides tailored to the needs and requirements of customers. We can arrange a photo session in the saddle among the monuments Tykocin. Horse back trips among the area – We also provide a group rides with a guide or accompanied by a naturalist, who will show great charms of nature. Horse back riding classes – 1 hour with the instructor where you can learn the basics of riding secrets. Wedding Photo sessions on the horses and in the area of the house manor house. Since years, residents of Pentowo are accompanied by horses. In the old days horses were used more for field work, now they also serve, but in a slightly lighter form. They are used for horse riding, or harnessed to the carriage. 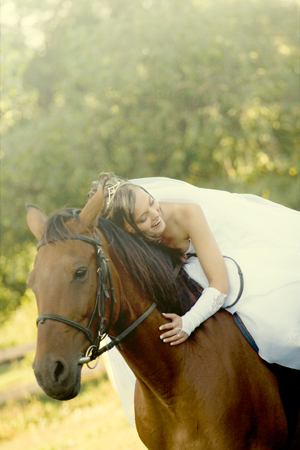 Very often, we provide our horses for photo sessions for “just married” couples. These noble animals show the beauty of a wedding dress, and the ride reflects the romanticism which is needed during the wedding day, and visible on the pictures.